NACP is open to any individual, paid or volunteer, who provides services to those victimized by crime, and who meets the standardized training requirements. 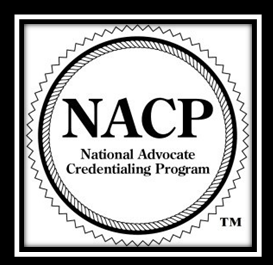 Developed through the cooperative effort of multiple national and state victim assistance organizations, NACP was launched in 2003 as the first voluntary credentialing program available to crime victim advocates nationwide. As the first voluntary credentialing program available to crime victim advocates nationwide, NACP is uniquely positioned to create new standards and professional recognition for victim advocates. What's the Value of "CA"? NACP credentialed advocates are encouraged to use the letters "CA" after their names to represent their professional status in the victim advocacy field. Once you become a credentialed advocate, you have joined a distinguished movement of professionals across the globe.